WASHINGTON (AP) — President Barack Obama embarked Thursday on his first trip aboard Air Force One, jetting off on a quick hop in hopes of pushing his economic rescue package through Congress. The run to a House Democrats‘ retreat in Williamsburg, Va., is a telling choice for Obama’s first trip outside the Washington area. “He’s saying that he’s willing to go anywhere and talk to anybody in order to get a recovery and reinvestment plan that moves this economy forward,” press secretary Robert Gibbs said. For the short flight, Obama took the traditional blue-and-white 747, not one of the smaller jets that fill out the presidential fleet. Air Force One, with its history and distinctive markings, makes a statement — especially on the commander in chief’s maiden voyage. On departing from the White House to Andrews Air Force Base, Obama broke from tradition as he boarded Marine One, the presidential helicopter, on the South Lawn. He seemed to stun the marine standing at attention by reaching out to shake his hand. The marine obliged, shaking the president’s hand before returning to a steady salute. Some White House staff members slipped out of the West Wing to catch a glimpse of Obama’s first Marine One takeoff. At the Air Force base, Obama climbed up the stairs and headed straight on the plane, with no wave to observers below. Gibbs said the president had enjoyed the chopper ride. “He said, `Pretty smooth,'” Gibbs said. Before Thursday’s trip, Obama had been on a smaller jet that serves as a presidential plane, when he flew from Chicago to Washington in the days before his inauguration. But it was not known as Air Force One, as that designation applies to any plane the president is on. As for other recent presidents, George W. Bush’s first flight as president may sound familiar. Two weeks after his swearing-in, and following the bitter 2000 recount battle, he went to a resort near Pittsburgh to talk to skeptical Democratic lawmakers. The subject was his tax cuts. In 1989, Bush’s father, a former Navy pilot, took his first Air Force One trip as president to the Norfolk Naval Base in Virginia. Long before his son’s notorious “Mission Accomplished” speech, Bush spoke on an aircraft carrier — about wasteful military spending. Ronald Reagan, at 69 the oldest man to assume the presidency, took a more leisurely approach. His first out-of-town trip was by helicopter to a restful weekend at Camp David in Maryland. His maiden Air Force One trip was to California — and a restful weekend at his ranch in the Santa Ynez mountains. Presidents invariably reveal their personality on board. The garrulous Clinton would restlessly roam the jet, chatting with aides and reporters or sitting down to play hearts. The younger Bush usually stayed put up front and hardly ever saw the press compartment; aides had warned him offhand remarks there could cause trouble. First crisis of the Obama Gov’t… (the economic crisis started before he was even elected). WASHINGTON — The Obama administration hit an unexpected rough patch on Thursday in its plan to give itself time to decide how to prosecute Guantánamo detainees. A military judge in the case of one of the best-known terrorism suspects declined an administration request to delay an arraignment scheduled for Feb. 9. The decision differed from rulings by two other military judges in the war crimes system at the prison in Guantánamo Bay, Cuba, who last week granted requests filed by military prosecutors for four-month delays so the new administration could study detainees’ files and its legal options. The two Boeing 747s which operate as Air Force One are flown by the 89th Airlift Wing of the U.S. Air Force. What is Air Force One? Most people have a general idea that the president’s plane is a flying office with all sorts of high-tech equipment. But there are two essential facts about Air Force One that the general public isn’t aware of. “Air Force One” isn’t technically a plane: It’s simply the radio call name for any U.S. Air Force plane carrying the president of the United States. As soon as the president steps aboard an Air Force plane, that plane is referred to as Air Force One by the crew and all air traffic controllers, in order to avoid confusion with any other planes in the area. If the president rides on an Army aircraft, that aircraft is Army One, and whenever he boards his specialized helicopter, that craft is Marine One. Civilians generally refer to the physical plane itself as Air Force One, of course, and we will in this article too. The Hollywood VersionAir Force One got its Hollywood close-up in the 1997 Harrison Ford movie “Air Force One.” While some of the details in the set are inspired by the real thing, the movie takes major artistic liberties. The Air Force says the real plane does not have an escape pod, as depicted in the movie, or even onboard parachutes. Of course, an escape pod could be one of the many special features the Air Force won’t talk about. Air Force One has 4,000 square feet of interior floor space. Much of it looks more like a hotel or executive office than a jetliner, except for the seatbelts on all the chairs. The lowest level of the plane mostly serves as cargo space. Most of the passenger room is on the middle level, and the upper level is largely dedicated to communications equipment.The president has onboard living quarters, with his own bedroom, bathroom, workout room and office space. Most of the furniture on the plane was hand-crafted by master carpenters. The staff meets in a large conference room, which doubles as the president’s dining room. Senior staff members have their own office area, and the rest of the president’s staff also has space to work and relax. There is a separate area for reporters traveling with the president, and there is plenty of room for the flight crew to do their work. All in all, Air Force One can comfortably carry 70 passengers and 26 crew members. Air Force One has a certain mythic, mysterious quality, largely because it is completely off limits to most of us. Even visiting politicians and journalists aren’t allowed in some parts of the plane, and the Air Force is careful to conceal specific details of the craft’s layout. A number of official and unofficial sources have published general descriptions of what’s inside the plane, but nobody (as far as we know) has said how these pieces fit together. Here at HowStuffWorks, curiosity got the best of us: We had to connect the dots. This illustration represents our best guess, based on the available information, of how the most famous jetliner in the world is put together. Like an ordinary Boeing 747, Air Force One has three decks. The lowest deck holds luggage, food and classified equipment. The middle deck holds the bulk of the passengers. The upper deck consists of the cockpit and the communications area. Passengers can enter through three doors. Two doors, one at the front of the plane and one at the rear, open onto the lower deck, and one door at the front of the plane opens onto the middle deck. Normally, when you see the president in the news getting on and off Air Force One with a wave, he is using the door onto the middle deck and a rolling staircase has been pulled up to the plane. Journalists normally enter through the rear door, where they immediately climb a staircase to the middle deck. Most of the press area looks something like the first class section of an ordinary jetliner, with comfortable, spaced out seats. The crew generally enters through the lower door at the front of the plane. From here, they can proceed to the cargo area or climb a staircase to the middle deck. The staff area is in the front section of the plane, on the middle deck. The galley and conference room/dining room are to the right. The conference room is one of the biggest rooms in the plane — it’s almost as wide as the plane. A narrow passageway leads to a work area and the rear passenger compartment. The president’s suite and office is to the left of the entrance, on the middle deck, at the front of the plane. A stairway near the middle deck entrance leads to a landing area on the top deck. The flight crew walks straight from the stairway to the communications room, lounge and cockpit. Every Air Force One flight is classified as a military operation, and it is handled as such. Air Force crews at Andrews Air Force Base in Maryland carefully inspect the plane, and the runway, before every flight. The most remarkable feature on the plane is it’s extensive electronics. It has 85 onboard telephones, a collection of two-way radios, fax machines and computer connections. It also has 19 televisions and assorted office equipment. The phone system is set up for normal air to ground connections and secure lines. The president and his staff can reach just about anybody in the world while cruising tens of thousands of feet in the air. The onboard electronics include about 238 miles of wiring (twice the amount you’d find in a normal 747).Heavy shielding is tough enough to protect the wiring and crucial electronics from the electromagneticpulse associated with a nuclear blast. Another special addition is the in-flight refueling connection. As with the B-2 and other combat craft, in-flight refueling gives Air Force One the ability to stay up in the air indefinitely, which could be crucial in an emergency situation. Some of the most interesting parts of the plane — it’s advanced avionics and defenses — are classified. But the Air Force asserts the two planes are definitely military aircraft, designed to withstand an air attack. Among other things, the plane is outfitted with electronic counter measures (ECM) to jam enemy radar. The plane can also eject flares to throw heat-seeking missiles off course. The president always arrives at the base with “the football,” the briefcase that holds the codes for nuclear deployment. An Air Force officer guards the football for the entire flight, before passing it off to an Army officer on the ground. Check out NatGeo’s series “On Board Air Force One“. Journey inside the most secure aircraft in the world, Air Force One, as it carries the President through the confusion and terror of 9/11, a secret mission into Baghdad and a whirlwind diplomatic mission through the Middle East. With unprecedented access, National Geographic introduces you to the presidential pilot and the crew charged with operating this global command center in the sky. Explore Air Force One now! 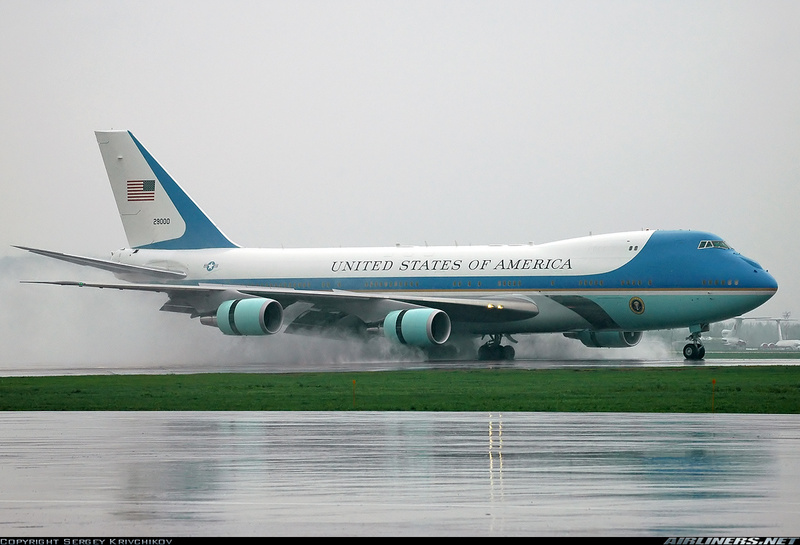 Explore Air Force One at NatGeo’s site.